If you love entertaining and utilizing your outdoor space, installing an outdoor kitchen can make things much more convenient. Rather than leaving your guests to cook food inside, you can have all that you need within arm’s reach. A functional outdoor kithchen will allow you to interact and spend more time with your friends and family while being the grill-master. When planning an outdoor kitchen, the first step is to forget about your indoor kitchen. Ideally, in your backyard, you should be able to take care of everything that you would normally do indoors. The whole point is to avoid having people going in and out for ice or glasses. Therefore, making sure you have all that need at your fingertips will lead to ultimate success in your outside space. If this is your first time putting in an outdoor kitchen, it may take a while to figure out how to set it up and where to put everything. I highly suggest that you get hold of a plan of your home and garden (if you don’t have one, then it’s fairly easy to draw up yourself) and then pencil in where things will go. You will need to work out which area is best to lay out the kitchen in terms of plumbing and electricity, how close you want it in relation to the house, and how much room you have for seating for your guests. If you currently have a barbeque area with a table and chairs, can you renovate this space, or will you need to look at a different area? 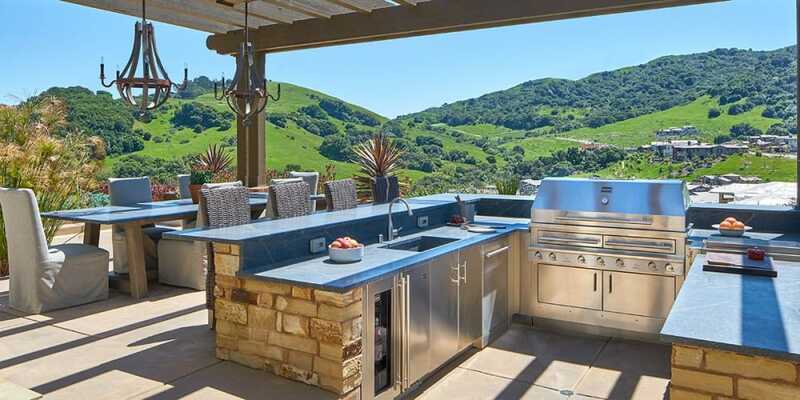 The success of an outdoor kitchen space is often down to the appliances that you choose. By starting your kitchen journey with Designer Appliances, we can walk you through all the options available to you and how they can work for your lifestyle. This is a great foundation for planning your outdoor project. We can then connect you with our large network of outdoor designers and tradesmen so that you can move your project onto the next step and be in the hands of some of our trusted professionals. The perfect grill for your outdoor kitchen will be one that not only grills meat but also provides other functions. A grill that allows you to boil water and heat pots is great for when you want to cook corn or make sauces, so you can keep all cooking preparation outside. Ensure to look for a grill that has a higher nickel content in the stainless steel so that it will keep its shiny finish for longer in your outdoor setting. Pizza ovens are a lovely addition to an outdoor kitchen if you want to cook something other than meat on the grill. These kinds of ovens can be used not only for pizza but for cooking casseroles or finishing off steaks that have been seared on the grill. You may think that one refrigerator will be enough, but an ideal outdoor kitchen setting should have two. One fridge should be dedicated only to condiments and salads which will be kept near the grill or main cooking area, and the second will be for wine, beer and sodas, placed somewhere easily accessible by you and your guests. You don’t want to be running to the house every time you need ice so having an ice maker in your outdoor kitchen will solve this problem. Ice makers make clear ice which is free of impurities, ideal if someone wants a scotch. You will need a drain for the ice maker, so if you are also getting a sink installed then these should tie in together. It may seem somewhat of a luxury, but if you don’t fancy washing the dishes yourself in the sink then getting a dishwasher installed will save you all the hassle. Having a dishwasher in your outdoor kitchen is beneficial if you are entertaining for long periods of time and want to clean up as you go, without spending too much time away from your guests. Smokers are a nice to have if you are dedicated to preparing meals and you don’t live within close proximity to your neighbors who might complain about the smoke. Smoking food takes time, usually around eight hours, which means you need to get it started in the morning. If you’re really into cooking and like the idea of a smoker, they are a good option if you have the time to use one. Remember that in order for your outdoor kitchen to be fully functional, you need to replicate the features that you would have indoors so that you don’t need to traipse in and out of the house. Before you get too carried away with your designing, make sure that all of these essentials are covered in your plan. Having electricity is key in your outdoor kitchen. You are going to need lighting for when the sun goes down and somewhere to plug in all your appliances, so make sure that there are enough power points strategically placed. Also think about whether you will have any electronics such as a stereo system, TV or projector, as well as a place for your guests to charge their phones if they need. While you’ll no doubt be making the most of entertaining guests outdoors in the summer months, you also need to consider what you’ll do when it gets dark and the weather cools down. You don’t want to have to shift your guests inside as this means unsettling your guests and having another area of your home to clean up afterwards. Investing in radiant heat poles or portable heaters, plus having a few blankets on hand, is a great way to ensure that you can stay outside as long as you want to. Think about how much prep space you are going to need outside. You’ll need space for making drinks and preparing salads and sauces. You don’t want to scrimp on space and find that you have to run inside to use the indoor kitchen. Ample storage space is also important as you are most likely going to have whole sets of cutlery, plates and glasses that are used for outdoor entertaining only. Why would you want to entertain guests outdoors, only to bring in plates and glasses inside to clean up? All cleaning can be done outdoors, you just need to make sure that you have a sink, running water and an adjacent place to stack dishes. If you choose to get an outdoor dishwasher, this should tie in with the sink. If you live in an area that has a lot of animals around, it’s really important that you get rid of your trash as soon as possible. Make sure to have a trash drawer, preferably close to your prep space so you can easily dispose of waste throughout the evening. Another option is to install a trash chute for your waste and have another separate container for recyclables. As you can see there are a lot of things to consider when designing a great outdoor kitchen. Talk to the team at Designer Appliances for expert advice and we will get you on the way to a fully functional outdoor kitchen that suits all of your needs.